Despite the fact that I have a Diploma in Complementary Healthcare, every now and again I am completely and absolutely gobsmacked at the power of plants. I am also amazed at how little they are used in conventional medicines – for horses, other animals and humans. Allergies are an over-reaction of the immune system to something it perceives to be a threat. Yes, even immune systems make mistakes. Your horse’s system’s perception of the pollen or the protein molecule or whatever it happens to be puts a number of biological steps into process. The end result of these steps is that an allergic reaction occurs – sneezing, rashes, itchiness, swelling. Itch mix possibly intervenes at one of those biological steps mentioned previously. Stopping that step could stop the entire allergic reaction. 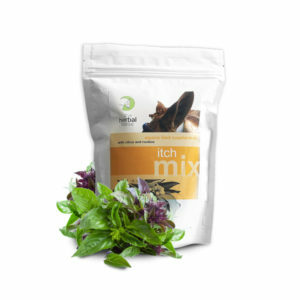 Itch mix was first invented as a more concentrated horsey version of our bestselling pet product, Itch (or Allergy) Formula. I thought that, seeing as we had helped a whole pile of itchy Jack Russells, we might as well do the same for itchy horses. And Itch mix has been working very well in horses who itch. But, it was one of my customers who, after a feverish night on the internet, suggested trying it for her horse who had laminitis. What she said made sense, so I sent her a pack for free. A week later, her horse was fine. A few months after that, he was competing in dressage again. After this, I did an informal trial. I sent ten packs to ten different horses with varying stages of laminitis. After this, we concluded that, if the laminitis is caught in a fairly early stage, before physical changes have occurred in the hoof, the condition is completely reversed. Eight out of the ten horses have recovered and are completely sound. It was then that I began to take this stuff seriously. A UK customer had a horse who was a bad head-shaker. I sent her 500g of Itch mix. Her comments after a week or two: “We have completely lost the violent head shake that snatched the reins out of my hand along with the striking out of the front leg. He doesn’t head shake when there are no flies about now, where as he did before when he was hot during work and when a fly hits his face his reaction is very muted and only what you would expect from any horse. We rode through a cloud of midges today and there was no reaction at all.” She used it in conjunction with Calm mix, which she said improved the result. As I said initially, all of this took me a bit by surprise. The ingredients are not unusual or ultra-expensive. Why has no-one else figured this out??? ?